A women travels miles just to collect a bit of water from this well. Image from Unamid. On March 22, the head of the Golo Veterinary Unit in Central Darfur “was beaten and had his head shaven by agents of the National Intelligence and Security Service after he refused to allow the sale of unauthorized meat to one of the butchers in the market”. Veterinarians in the area have gone on strike to protest this injustice. Those hiding from conflict in the remote caves and valleys of Jebel Marra are pleading for rapid interventions for the rampant spread of diseases in the area. Ranging from measles to pneumonia to dysentery, these diseases have already killed dozens and infected hundreds. Though not an example of physical violence, the government’s barring of humanitarian aid for its own citizens is just another example of abuse of its own people. On March 18, meetings began in Paris between Sudan Call alliance of opposition parties, and representatives of the government of France, Britain, Norway, the EU, and the USA. Sudan Call is urging these nations to stop dialogue with the current Sudanese regime, to keep Sudan on the list of state sponsors of terrorism, and to support the people of Sudan in transitionary efforts towards a democracy. 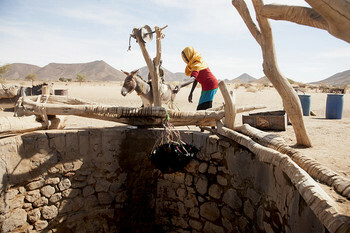 The extreme lack of water in East Darfur is a current major crisis. The destruction and disruption of water sources has not been addressed so far, and many callers told Radio Dabanga that there is an “extreme lack of water”. Residents from Abu Sineit area said that they must make a six-hour trip to find water. This is having a gravely negative impact on civilians, livestock, and agriculture. Economic hardship rages on in Sudan as hyperinflation remains another major issue. High prices of food, fuel and medicine, as well as limits on cash withdrawals are devastating many, due to a liquidity crisis within the government. Many report inability to access their February salaries, hence they can’t meet the basic needs of their families such as food and medicine. The same al-Bashir regime that orchestrated the genocide in Darfur is currently ordering brutality against peaceful protesters in Sudan. Your voices are urgently needed to expose al-Bashir’s crimes in Darfur and across Sudan. It takes only one action to contribute to ending genocide in Darfur and the unprecedented carnage across Sudan.